Backup drive in windows with FBackup. This is an excellent, simple and free software to backup documents on any drive.Though there are some good data recovery tools for windows, backing up data and recovery is always better than data loss and recovery. FBackup can be used to backup FTP, DVD, or any other removable media. You can either carry out full backup or mirror backups. Full backup is the starting point for all other backups and contains all the data in the folders and files that are selected to be backed up. Because full backup stores all files and folders, frequent full backups result in faster and simpler restore operations. Remember that when you choose other backup types, restore jobs may take longer. 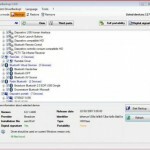 A mirror backup is identical to a full backup, with the exception that the files are not compressed in zip files and they cannot be protected with a password. 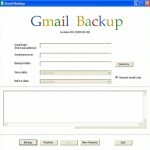 A mirror backup is most frequently used to create an exact copy of the backup data. It has the benefit that the backup files can also be readily accessed using tools like Windows Explorer. If you choose the Make mirror option, you can also check the Compress option to zip each file individually, preserving the folder structure. This allows you to use the zip compression and encryption features. FBackup also supports backup compression and creates either standard zip files (for full backups), or exact copies of the original sources without any compression (using the mirror backup type).The zip files can even be password protected . The utility also Keeps different file versions for the backups. It also has the ability to pause/resume the backup and it uses AES encryption.You can save your backup copies on your local hard drive or any external hard drive or a networked drive. You can configure and run backup copies at any time through a backup scheduler. You can schedule as many backup jobs as you need, each of them with their own configuration settings – and you can also restore backups, whenever you want. FBackup has a simple interface and has a friendly wizard that guides you through the process of defining a backup job. It also has an advanced interface that is more intuitive. Another noteworthy feature of FBackup is you will be able to back up a file in use by another program at the time of the backup, as it uses he Volume Shadow Service that Windows provides. Thus it can backup all open files too. However it does not directly support saving your backup to an FTP server.It also does not support incremental backups. 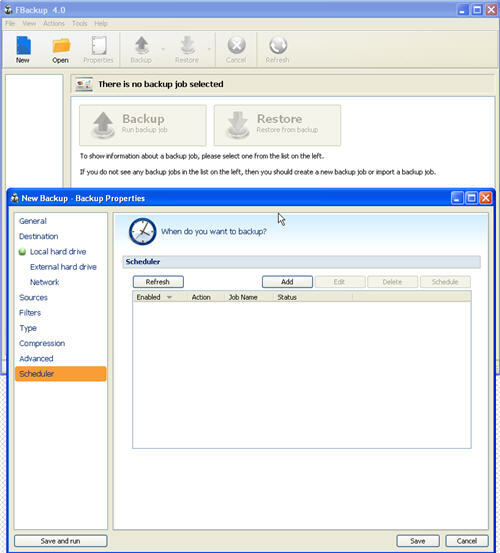 FBackup works on Windows vista/XP. Free download FBackup and enjoy the free drive backup software for both personal and commercial use . You can also try the free Snap backup, a windows and Mac backup utility. Snap backup is Java based and hence it can also be used as linux backup utility. Fbackup is very useful to backup our important documents containing valuable info whether it is office or home its data should be very important to backup.